Driving privileges are restricted to the areas of access for which the ID was issued. Your ID is a proximity card that is used to open the corporate gate (Gate 19). 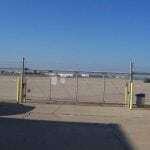 Access to this area is limited to and from your facility and the adjacent buildings. This area is leased and controlled by Tac Air who will advise you of your areas of access. 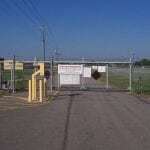 Access in this area is limited to the general aviation area. Your airport ID is a proximity card that is used to open the gates at the t-hangar facility. Access in this area is limited to the ramp area. Safety is the first priority! Airports are different than any other place you have ever driven. Each of us must make safety our first priority. One careless mistake could result in the death or injury of yourself or others. It’s up to each one of us to make sure we do everything we can to make the airport as safe as possible. All vehicles entering or exiting an airport gate must stop and block the gate with their vehicle until it closes. 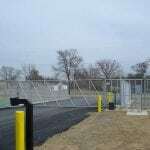 The purpose of this is to prevent someone who may not have access into the airport from entering through the gate. Unless you are escorting someone without an ID, never open the gate for someone else and do not let anyone follow you through the gate. If a gate malfunctions, do not leave it unattended. Notify the airport and someone will respond to your location. Vehicle and pedestrian access is strictly limited to the areas immediately around the buildings, or the ramp areas you have access to. The speed limit for vehicles on the ramp is 10 MPH. Always yield the right-of-way to taxiing aircraft and give them plenty of room. If an aircraft is headed toward you on the same taxi lane or ramp, move out of the aircraft’s way. No vehicle shall drive on the movement areas, which are runways or taxiways, or the airport perimeter/maintenance roads. There are no exceptions! Please immediately report to the airport any vehicle that appears to be driving in an unauthorized location. The regulations at the airport are implemented by the FAA and TSA for the safety and security of users. This requires the airport to take enforcement action any time a violation occurs. Violations can include: Suspension of privileges, Suspension of airport access, or Permanent Revocation of privileges and access.